2010 Junior Equestrian, Kelsey Kimbler. Photo by Paschal Karl. Lexington, KY – The United States Equestrian Federation (USEF) is pleased to announce Kelsey Kimbler as the 2010 Junior Equestrian of the Year. This highest of honor offered to a junior equestrian comes on the heels of another big honor Kelsey earned earlier this month – the 2010 USEF Youth Sportsman’s Award, sponsored by Breyer Animal Creations. This puts Kelsey in elite company, as one of only a handful of junior equestrians to accomplish both feats in the same year. The 17-year-old high school senior has shown an unwavering commitment to her sport. As a young child, she started in the show ring with walk-trot. 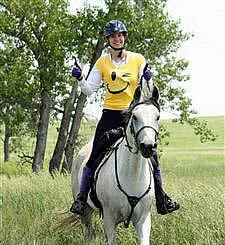 Soon after, she continued her riding with endurance and has never looked back. Kimbler has won the AERC Junior National Hundred Mile Award twice in its four years of existence. This award is given to the junior rider who completes the most 100-mile rides in one year. Kimbler holds the record for being the only junior to complete five such endurance rides in one year. She also has represented the AHA Youth Association as her region’s delegate and through involvement in 4-H events with her Arabians. She was nominated by both the Arabian Horse Association (AHA) and the American Endurance Ride Conference (AERC).